1.-Take your picture at Plaza Caracol. 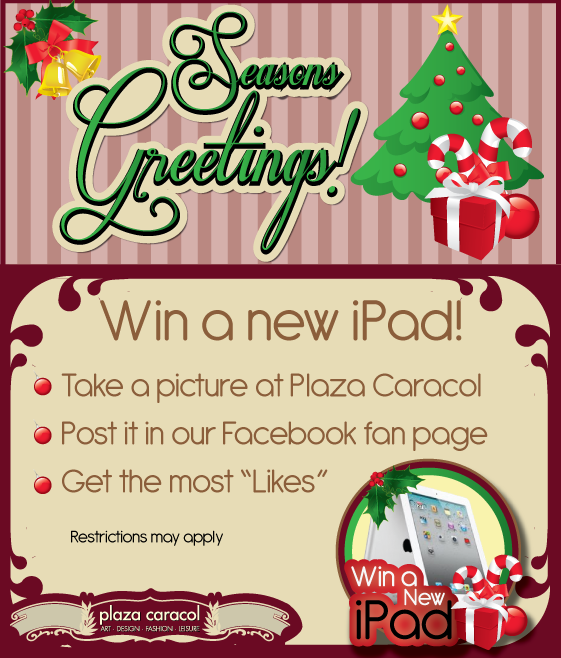 4.-Participation will be closed on January 18th at 17:00pm, The most "liked" picture will win the new iPad. In case of a tie, the person who posted its picture first will win the iPad. that may constitute an attack to different ways of knowing and ways of living will NOT be accepted. Local owners and their families may not participate. The iPad will be delivered in person or sent on monday january 20th. Local Winner, the prize will be delivered at Plaza Caracol´s Admin office. For a winner from outside Cancun, the shipping fee will be paid by him.